With so much of a medical student’s future at stake, it’s natural that preparation for the USMLE can be big business accompanied by big expenses. While we were fairly impressed with Kaplan’s USMLE Mobile Step 1 Qbank and accompanying app, we were less impressed with the price of admission which boiled down to an expensive rental fee. The Qbank subscription fee even prompted some of us to reminisce about the halcyon days of the previous millennium when money plopped down for education meant receiving a hardcopy textbook with the information contained therein forever in one’s possession. At $24.99, USMLE Step 1 Déjà Review is a significantly cheaper option than Kaplan’s offering, with the bonus of knowing that the 4518 concepts presented within are yours in perpetuity, provided that you’re still using an iPhone in the future. I’ve deliberately used the word “concepts” over “questions” for a reason; while Kaplan’s offering consisted of meticulously designed USMLE-style questions complete with multimedia, Déjà Review felt more like a large stack of flash cards. While 4518 physical flash cards would be a nightmare to go through, this app provides the organizational framework that enables students to go through sections methodically, or randomly quiz themselves. 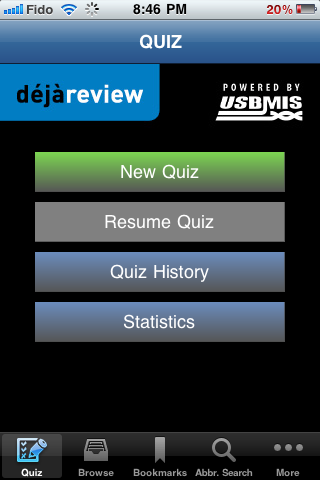 Upon opening the app, the main screen allows you to start a quiz, resume a quiz and review your history or statistics. The quiz mode throws a random selection of concepts at you. You are able to set quiz parameters to determine what subjects you prefer to cover, and specify the number of concepts you would like to encounter in this quiz. Now here is the reason for my likening the concepts presented to flash cards (indeed, the app itself refers to them as “cards”, not “questions”). As shown below, the questions are brief and largely knowledge-based (i.e. one does not need any problem-solving skills to answer the question – you either know it or you don’t). On entering the quiz, one is presented with similarly formatted cards in succession. After reading the question, one thinks about the answer, then taps the screen to view the actual answer. 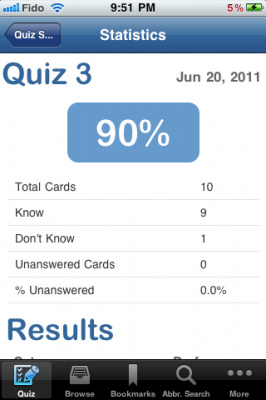 One would then mark the card as “know” or “don’t know”. 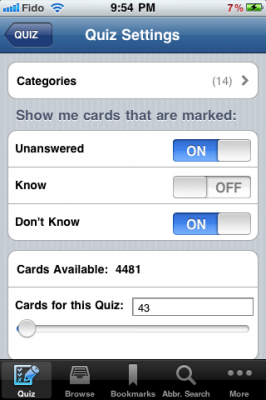 In this manner, the student is to go through all the cards in the app until he or she hopefully has all the cards marked as “know”. 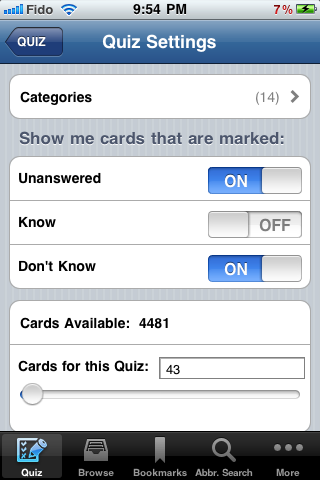 As shown above, one has the option of including or excluding cards marked as “know” when starting a quiz. Unlike Kaplan, there does not seem to be any multimedia based questions. 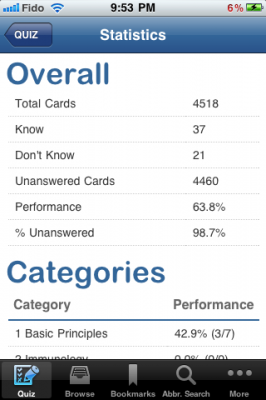 After finishing a quiz, the user is presented with a table of results with a statistical breakdown by section. 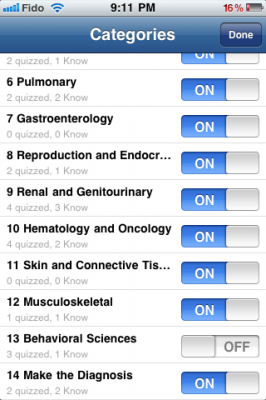 If you prefer to go about your studying more methodically, you can select an area of medicine and narrow down the topic before going through the cards in that manner, again marking cards as “know” or “don’t know”. 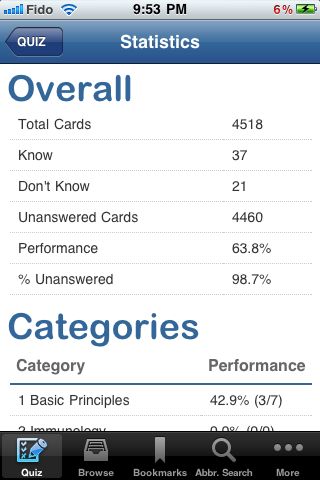 You are also able to check your progress by checking how many cards out of the total that you have marked one way or the other. 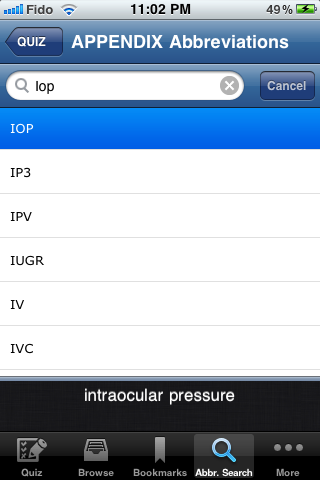 There is also a helpful abbreviation search tab that enables you to check out abbreviations used within the app, though it is by no means as robust as a dedicated app such as Medical Abbreviations. 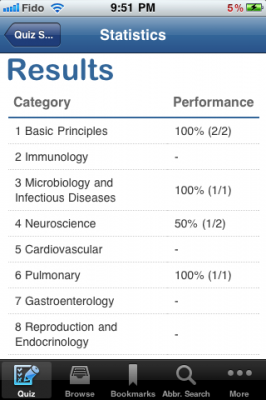 Compared to Kaplan, USMLE Step 1 Déjà Review stacks up favourably from a pricing standpoint. The content however, is by no means directly comparable to Kaplan. While Kaplan provides very meticulously engineered questions replete with multimedia, detailed explanations, and short summarized explanations, Déjà Review mainly provides short question that only test your knowledge on that subject, not your ability to apply that knowledge. That may not be a disadvantage if you are looking for an app to help you quickly skim through many concepts, but in terms of being prepared to answer the multistep USMLE questions, Déjà Review falls short. Definitely give this app a look if you are on a tight budget or are looking for something to help you review concepts. 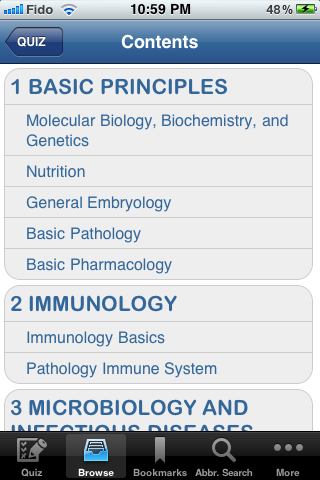 If you want to prepare with USMLE-style questions, you should look elsewhere. Questions are very short and only test your knowledge, not your problem-solving ability (which is the whole point of USMLE questions). 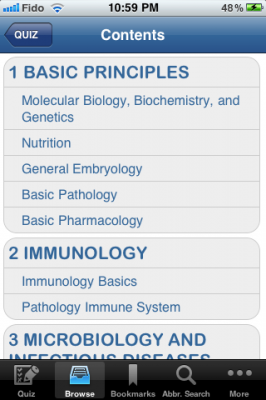 USMLE Step 1 Déjà Review is a relatively cheap way to quickly review many key USMLE concepts. However, it only tests your knowledge and not your problem-solving ability. If you would like to be tested with USMLE-style questions, this app would fall short.